Rory McArdle (right) with Bradford City team-mate Nathaniel Knight-Percival. Experienced Bradford City defender Rory McArdle is being pursued by Peterborough United. That’s the opinion of media men in West Yorkshire, who are convinced the out-of-contract Northern Ireland international is all set to leave Valley Parade with League One rivals Posh and Scunthorpe the two clubs interested in gaining his signature. McArdle (30) is Bradford’s longest-serving player. He has made 231 appearances for them since signing in 2012 and has scored 15 goals. 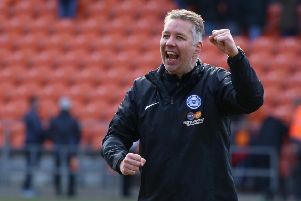 He was rock-solid in the second-best defence in the division last season and appears to fit the bill for Posh. Chairman Darragh MacAnthony has revealed they are chasing “stronger characters” to add to the squad. Without naming any names, he has confirmed that one of the offers they have put in is for a centre-back. Bradford boss Stuart McCall has admitted he expects all five of his out-of-contract players to leave because they are likely to receive better offers elsewhere. McArdle is currently on holiday in Cuba.